Parents of young children (under 6 years) often ask two important questions. 1. Do you have experience teaching young children? 2. What do you actually teach? Teaching young children guitar is an extensive subject that would require a book or two to really cover in detail but a good way to answer these questions is to share with you the advice I would give to a an inexperienced guitar teacher if I had to summarise in one page. So here goes. Working with young children is a never ending learning experience and when you meet a very young student for the first time you are most definitely under pressure as every child is unique. Here are a few strategies that almost always work well so hopefully they will get you started. Parent involvement. - Involve parents as much as possible. E.g. 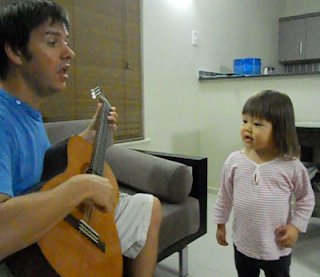 Ask the parent to clap along with their child or ask the child to show their parents the parts of the guitar. "Can you show Mum/Dad which string is No.1?" Keep it fun - Don't worry too much about what they learn in lesson one. Play games and keep it fun. Ask them if they can sing any songs. E.g. Twinkle, twinkle and have a sing a long. By starting with something that is familiar to them they will relax. If everything is new and strange they will feel uncomfortable and out of place. Parent expectations - Your real client is the parent (not the child). Every parent has certain expectations from the lessons. They want to know that you have the experience to meet those expectations. Once understood explain your plan for their child's education. You are a stranger - A young child will often be shy at the first lesson because you are a stranger. Some parents can misunderstand this shyness for a lack of interest so it helps to explain to the parents that this is normal and that it will take time for their child to become comfortable at the lesson. Next show the parent what you would like them to do at home. Confidence - Lessons with young children often come with surprises such as a child refusing to participate in the lesson. Treating such situations as normal will reassure parents that you are confident because the reality is young children just need time to become used to a new environment. I will often to say "The first few weeks are usually a bit strange for them so don't be surprised if next week he/she doesn't want to come to the lesson. The trick is to come anyway and in a month or two they will look forward to coming. Its all about routine and familiarity." Hope that helps and please feel free to email me at anytime. Starting out young is the best time so if you are a parent with a young child now is the time to get them started. Some teachers do not take on young children so keep looking until you find a teacher who accepts younger students and if at first you don't succeed keep searching.